Home / Rhône / Malmont / Thirst-Quenching New Provençal Rosé. We’d bet that many readers have garages bigger than the Domaine Malmont’s winemaking space. We work with some small-production winemakers, but even by our standards Malmont’s winery is tiny. The space attached to winemaker Nicolas Haeni’s house in Séguret looks more like a large tool shed than a winemaking operation. But from this tiny place Nicolas crafts some of the most exciting wines in our portfolio. Last year for the first time he allocated us a small amount of his excellent rosé, and it quickly became a favorite among our readers. This year’s allocation isn’t any bigger, but the quality is even better. Malmont’s vines are high in the hills to the east of Séguret, a series of terraced vineyards that he farms with minimal intervention. His winemaking is similarly restrained, where he uses only ambient wild yeasts, and allows the fermentation to proceed at its own pace. The result is honest wines full of precision and complexity. 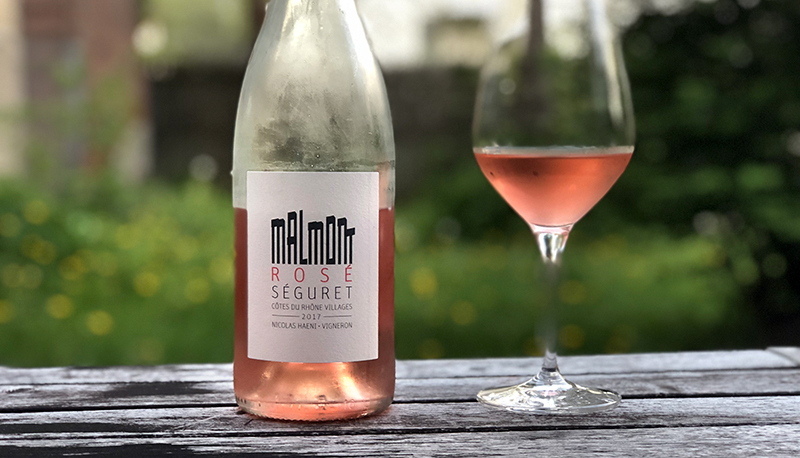 Malmont’s 2017 rosé is a blend of Grenache and Syrah (75/25) and a blend of direct pressing and saigné (85/15). The nose shows light strawberries, lemon rind, tangerine, and minerals. The mouth is perfectly balanced, totally dry with excellent freshness and pleasant notes of herbs, lavender, and honey. It’s effortlessly drinkable — a refreshing glass that will transport you to Provence with one sip. We can’t think of a better match for a sweltering day like today.